Underdog Phil Lo Greco plans on beating Amir Khan this Saturday and taking his big money fight against Kell Brook for himself. Khan and Brook are supposed to face each other this summer in a big fight on Sky Box Office PPV in the UK, and even though neither of them is at their best this point in their respective careers, the British boxing fans are chomping at the bit to see them face each other. But the 33-year-old Lo Greco (28-3, 15 KOs) has a chance to upend Khan and Brook’s plans on fighting each other by pulling off an upset on Saturday. The way that Khan’s promoter Eddie Hearn of Matchroom Boxing is so dialed into make the Khan-Brook fight after all these years, he’ll probably go ahead and put the fight together straightaway even if Lo Greco knocks Amir out on Saturday. Hearn has wanted to make the Khan-Brook fight for years, and he likely won’t be deterred from his plans even if Khan is knocked out in the 1st round by Lo Greco. Obviously the PPV buys will suffer for a Khan-Brook fight if Khan gets knocked out by Lo Greco this Saturday, but you can never underestimate what the casual boxing fans are willing to pay to see. If they’re not paying attention to this Saturday’s Khan-Lo Greco fight, then they’ll be none the wiser if Khan loses, and they’ll still go ahead and purchase a fight between Khan and Brook in the summer. Realistically, if Lo Greco beats Khan, Hearn will be forced to put together a rematch between them straightaway. Khan can’t walk away from a knockout loss to Lo Greco without trying to avenge it at all costs, because the defeat would be so damaging to his career. There are some losses that a fighter can walk away from without it hurting their careers, but this isn’t one of them. Khan would absolutely need to face Lo Greco again for him to regain his credibility. Hearn might feed Lo Greco to Brook if he beats Khan on Saturday in their fight at the Echo Arena in Liverpool, England. But as far as a fair deal goes, I don’t think it’s realistic for Lo Greco to assume that he’s going to get a ton of money fighting Brook. Lo Greco will get a better payday against Brook if he destroys Khan, but he’s not likely to get anywhere close to a 50-50 purse split if he even gets the fight at all. At best, Lo Greco might get an 80-20 split against Brook. Even that might be way too high for Lo Greco. Hearn might offer Lo Greco a flat fee, ‘take it or leave it’ offer like he was rumored to have done with WBC heavyweight champion Deontay Wilder for him to face Anthony Joshua. “A true champion will fight through anything,” Khan said on social media. 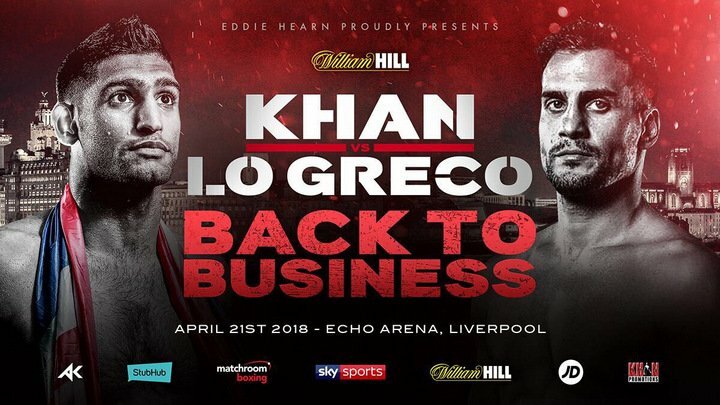 Khan is saying all the right things, but can his body hold up from the heavy shots Lo Greco is going to be hitting him with on Saturday night? Next boxing news: Otto Wallin faces Adrian Granat this Sat.